Want to quickly mask nail holes? The Nail Hole Tape roll features holes every two inches, allowing you to quickly mask nail holes before you fill them. Simply place a piece of tape over the nail hole, fill, peel, and sand. No more residue or discoloration! Need nails that don’t show? Our Blind Nail Kit allows you to have an invisible mechanical connector. Simply insert the dual head nail into the set tool to set the nail, then tap the molding or wood into place on the other side. The Kit includes the Blind Nail Tool and Blind Nails. Want to organize your Festool Tracks? The Track Bag was designed to organize and store all your Festool Tracks, However, it will fit other brands of track such as Makita, Dewalt, Triton etc. 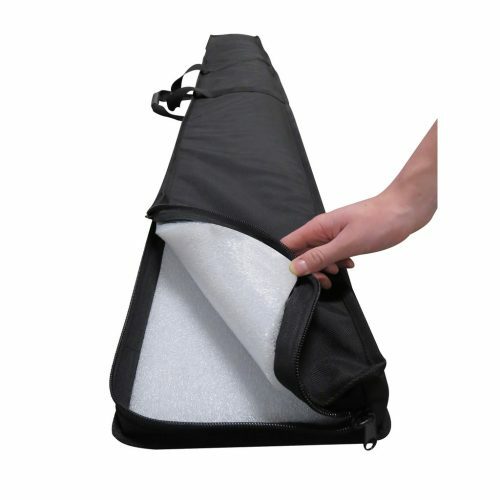 The bag is lined with foam to protect and cushion your tracks and has 2 easy access zippers. It can comfortably hold up to 5 tracks of varying size and length. Available in 76.5″ and 120″ lengths. The Pocket Diamond Sharpener keeps your Pocket Chisels and other tools razor sharp. It is available with either a 1000 grit or 300 grit sharpening surface on one side and a 600 grit surface on the other side. Built to last a lifetime. It also is part of our Pocket Tool Kit. Need a clamp designed for scribing and fastening stile trim cabinets? The StileRite is a specialty cabinetry clamp designed for one purpose; scribing and fastening stile trim to your walls, cabinets and shelving. The StileRite is a standard C-clamp fitted with a unique head featuring two tapered 5mm pins, 32mm apart to fit into any standard euro style shelving system. No more need for large clamps or more hands to apply adequate pressure when fastening or bonding stiles to cabinets, especially near walls or in tight spaces. Want to give our Mandrel a twist? Paul Akers demonstrates FastCap’s Quick Mandrel … all it takes is a quick twist! Justin Lahaie, of Hillcrest Cabinets, sent us this video showing his creative use for FastCap’s Remote Control Vacuum (RCV). For more information on on this product, visit our website. Paul Akers uses FastCap’s 10 Million Dollar Stick to keep his fingers safe when making custom blocks. The Super Mag is great for any time you want to hold something to a metal surface. It is powered by 6 high-performance neodymium magnets encased in soft non-marring EVA. An extra long knob allows for quick placement and removal. Do you want to know how far out you are? Want to really know how far out of level or plumb things are? With the How Far Out Level Gauge you can quit guessing! Installs quickly onto almost any level, snaps on and off magnetically. For more information on FastCap’s “How Far Out” Universal Add-On Level Gauge, visit our website.